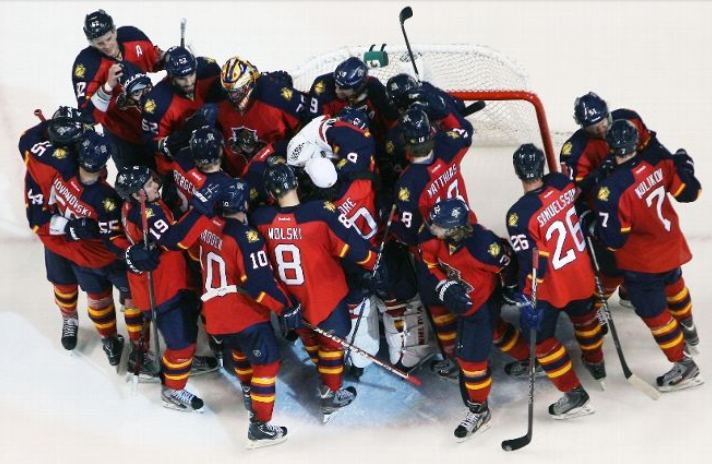 It took a while for the Florida Panthers to get going — or even get the game to get started for that matter — on Thursday, but the Cats put together arguably their best performance of the season against one of the league’s best in the Washington Capitals, who had only lost five times in regulation all year. From Jaromir Jagr’s record-tying goal in the game’s opening minute to Logan Shaw’s empty-netter, his second goal in as many games, the Cats put together a fantastic performance that focused on following a great game plan, not getting caught out of position and pouncing on any offensive opportunities they had against Caps backup goalie Phillipp Grubauer. Team play. From the opening puck drop, Florida seemed faster and much better prepared than they did against Ottawa. Maybe it was the lull of returning from that five-game road trip or just a poor game against a Sens bunch that has plenty of talented players. Whatever the reason, Florida (14-11-4) played out front the whole game, prevented scoring chances for the Caps and were simply the better team. Florida’s blocking 16 Washington shots and winning 54 percent of face-offs were keys to getting a victory before starting a four-game road trip. Jagr and Brandon Pirri. Hopefully, Florida fans can look forward to these two key scorers bringing their A game a little more often, especially with fellow netfinder Nick Bjugstad sidelined. Jagr’s goal was the net-presence factor Florida has been lacking; Pirri’s a howitzer that resembled the blasts he fired often last year during a 22-goal season. Florida really needs this pair to contribute nightly. The blue line. With Steven Kampfer and Brian Campbell going out with injuries, the defensemen had to step up and did. Aaron Ekblad, Dmitry Kulikov, Erik Gudbranson and Willie Mitchell picked up the slack, were on the scoresheet some and kept one of the most skillful offenses silent until two minutes left in the game. Skill, skill, skill…Jonathan Huberdeau’s slick saucer pass to Ekblad resulted in one of the best scoring plays of the year and gave Florida a 3-0 lead that left little drama in the contest. When your former Calder winner is leading a 2-on-1 break to your No. 1 overall pick/Calder winner from last year, well, you like your chances of changing the number on the scoreboard. A skill goal all the way around. Good night for Al Montoya. In a rare start, Montoya was very good against the Caps and ran his record to a strong 4-1-1. With back-to-back games in New Jersey and Raleigh next week, the Big Cubano will be back in goal in one of those games. He can hope the defense in front of him only yields 20 shots again by playing a sound defensive game, blocking shots and turning clearings into breakouts and odd-man rushes. In all, this win was simply as textbook as it gets. EMPTY-NETTER: The NHL has gone out of its way to bring about more safety to the league, basically protecting the unprotected player along the boards. The five-minute boarding major and game misconduct the Caps’ Tom Wilson received was well deserved, but if the NHL wants to prove it is serious about player safety, it will sit Wilson for a game or two, sending a message to the edgy forward that a thuggish style of play won’t fly in the new NHL. There’s just no place for that hit in this wonderful game. This entry was posted in Uncategorized and tagged Aaron Ekblad, Brandon Pirri, Brian Campbell, Erik Gudbranson, Florida Panthers, Jaromir Jagr, Jonathan Huberdeau, Logan Shaw, nhl, Washington Capitals, Willie Mitchell. Bookmark the permalink.